Any fan of live music knows what it’s like to see a good show – not just a “cool, that was worth my 5 bucks at the door” kind of show, but a truly goosebump-inducing blow your mind kind of show. It’s the kind of show that keeps you up at night reliving it and sits fresh in your mind the next day. One of these shows for us was the first time we heard Dylan Linehan and her magnificent piano (click here for our review of that show). She’s continued to perform since then, and is now releasing her debut album, Pericardium, featured in our Karmic Fury Records album review series. Pericardium is best viewed as a companion piece to Linehan’s live performance. The album is beautiful yet restrained. In order to appreciate the work that went into capturing her emotional energy in a medium like this, like a great Broadway musical, you really must really see and hear the live performance. The Broadway musical analogy is especially apropo, as Pericardium sounds like the soundtrack for a theatrical production. Linehan has scored student films and is also working on the score for a feature film with her father, Terry, and this sense of an underlying story is apparent on the album. Pericardium opens with a thundering piano leading into “Tazmanian White”, a different kind of love song about a free spirit. The dramatic chorus will get stuck in your head, as it’s been in ours since we popped in the CD several days ago. The drums and well-placed backing vocals really flesh out the arrangement, which is pushed along by strong piano riffs throughout. Linehan’s vocals sound a little bit thinner than we’re accustomed to, one of the unfortunate side effects of studio compression, but the emotion shines through, especially when she really unleashes near the end against a backdrop of piano, electric guitar, and shouted background vocals. One part in particular reminds us of Kate Bush. A hauntingly beautiful 25 second vocal interlude segues into our personal favorite track on the album “For Us”, which is probably also the song most likely to appeal to the mainstream sector. From beginning to end, the arrangement is breathtaking, with percussive, yet soft strings adding a lightness throughout the song that perfectly accompanies Linehan’s sweet vocals. The light pop song is simple and delicate and could easily make its way onto a movie soundtrack. By the time the song ends in a decrescendo of vocal harmonies and strings, we’re completely enamored. We can’t get enough of this song. “Oh Fixation, Please Fix Me” starts off in a similar vein, before launching into a full out rock opera in the chorus, complete with passionate backing vocals and electric guitars. The lyrics pack a punch too, with lines such as “You won’t remember me, I’m just a happy memory for someone else to find.” Linehan keeps her verses sweet and subtle and then exudes force and fury in the choruses, her technical and emotional ranges both apparent as she addresses addiction. There is some nice electric guitar work in this one as well – the riffs are clean and effective without being too much, in addition to some more excellent string work. The next song, “Fireside”, begins with a piano riff and big chorusy vocals that remind us of one of the more tender moments of a Tim Burton movie. Even at its sweetest, the song has an undertone of dark drama. In the bridge/chorus, a beautiful low cello helps escalate the song into a more upbeat but no less sweet apex before tapering off into an absolutely lovely and soft conclusion. “Forever I’m yours, and you’re mine”, indeed. We have hardly a moment to recover before being launched into a slow cello solo that sounds downright sinister. Not exactly what one would expect from a song called “BFF”, the bitterness oozes out of every note in the first few slow lines before launching into full rock opera territory with help from more guitar and drums. She really lets loose on the vocals, too. “You could have treated me right…Is this what you wanted? You wanted a fight? Well now you got what you had comin’!” Zing. At this point, the album shifts away from full band arrangements to more bare bones instrumentation, where it stays through the remaining songs. When we asked her about this transition, Linehan answered that it was indeed a deliberate decision intended to strip away the layers in order to get to the origins of it all, the “music within the music”. With only her voice, piano, and occasional subtle strings, “Carry On” is a tender testament of Linehan’s attention to emotional nuance. The perfectly executed vocal phrasing, sometimes almost a whisper and then rising to a plea and back again, is extremely effective. While Linehan sounds great with the band, she knows when to let the music speak for itself without any frills. “Another Day Like Sunday” is another piano/vocal showcase with some nice theatrical lines that are almost playful and sing-songy if not for the underlying cynicism. She plays some great classical/theatrical piano in this song. By the final refrain, the song becomes a funeral dirge and the heartache in Linehan’s voice is apparent. Luckily, we’re rescued from despair with the sweet sounding “Coupon Book” about the excitement and trepidation of a new love. Even here, however, Linehan and her piano don’t rest easy. “I could give you a coupon book for all the things I’d do for you, But we both know I only give favors on paper, It’s only ink in navy blue,” she whispers as the song winds down. The album concludes with the funhouse carnival piano masterpiece that is “Medusa’s Zen Garden”. Over seven minutes in length, the piano work in this song is downright impressive. She also has some nice expressive vocals that escalate into what we can best describe as a “whoop”. The parts where she speaks the words in between echoing vocals make us feel like we’re at the crucial conclusion of an epic theatrical masterpiece. The urgency in both vocals and piano is apparent and effective. The lines, “I am not the girl I used to be. There’s a cage around my heart, you’ll never find the key!” are a fitting end to the album as a whole. Pericardium is by definition a tough double layered membrane which covers the heart. 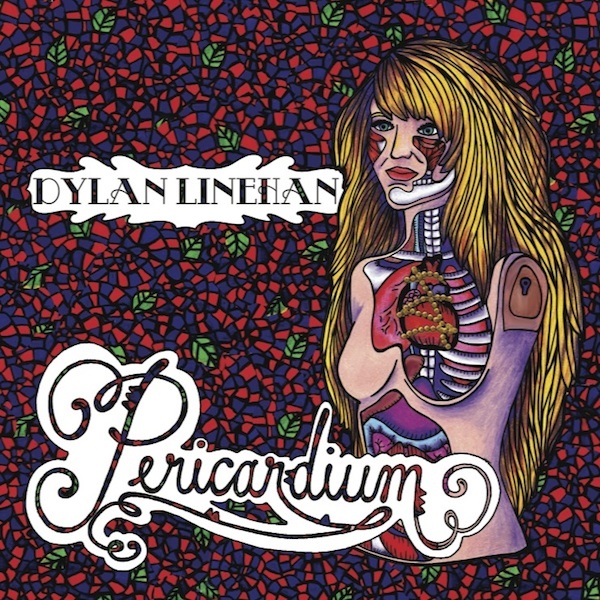 This is the metaphor that ties all of the album’s songs together as Linehan allows her questions, emotions, stories, and music to flow through punctured holes in her pericardium. In her own words she explains: “In every song, there is the challenge of breaking through a wall, posing the questions of how we use our bodies as the ‘pericardiums’ for our souls. How do we hide our pain? How do we cope? How do we thrive and break down our walls of fear? Why do we build our walls to begin with, and what are they made of?” With her unique and theatrical style, Linehan can’t help but pierce through the pericardium of each listener. By the conclusion of the album, beware, for your heart may lay open and exposed.